"Made by boiling ground, crushed, or chopped cereal in water, milk, or both", Isha was saying, "Porridge was a traditional food in much of Northern Europe and Russia." "British author Robert Southey wrote about the importance of having it just right, not too cold, and not too hot, in his famous 1837 Goldilocks fairy tale 'The Story of the Three Bears'." "But porridge is much older than that. Oats have been found in the stomachs of 5,000 year old Neolithic bog bodies in Central Europe and Scandinavia." "Wikipedia says that it was primarily a savory dish, with meats, root crops, vegetables, and herbs added for flavor." "Until leavened bread and baking ovens became commonplace in Europe, porridge was a typical means of preparing cereal crops for the table." "It was also commonly used as prison food for inmates in the UK prison system and so 'doing porridge' became a slang term for a sentence in prison." "It has come a long way from there Ma", Hosh laughed, "as it is now a common breakfast dish in many English speaking countries." "Ya", Isha laughed too, "The modern world rediscovered it when they wanted a cheap, healthy, instant breakfast. The fact that it was easy to cook, easy to digest, and easy to blend with different flavorings made it fashionable." "Hot cereals are often prepared as instant breakfasts, but Porridge is one of the easiest ways to digest grains or legumes. That's why it is traditionally used in many cultures to nurse the sick back to health. It is also commonly eaten by athletes in training as with full-fat milk it makes a diet rich in protein and fat." 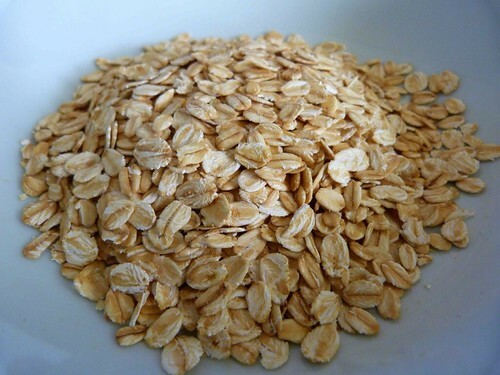 "One part of oats can be cooked in two to four parts of liquid. A ratio of one part of milk to two of water is pretty healthy. Some people don't like two parts as it goes gluey, some don't like four as that's too loose for them. When you make it, experiment a bit and you'll know what works best for you." "Pre-soaking is recommended by some, but a comparative test found very little difference in the end result. Toasting the oats beforehand for a couple of minutes though, gives it a nutty, roasted flavor that some people like." "The actual recipe is quite simple. 1/2 cup or about 50gm rolled oats will make one serving. Do a 2:1 water-oat ratio in a microwavable bowl of suitable size for the number of servings required." "Microwave uncovered on high for a couple of minutes per serve. Remove from oven, stir, and back it goes in the microwave for another minute. Then stir and serve if you are in a hurry." "If cooking it on a stovetop, I generally bring it to a boil. Simmer for 2-3 minutes, while stirring occasionally until desired consistency is reached. I'll also generally add sugar or honey to taste, but you don't have to." "In either case, I tend to leave it a few minutes before serving. It brings out a bit more flavor in the dish. Plus.it cools down to a temperature that will satisfy our big bear." They both laughed at her big bear pun. "If you vary the toppings", Isha continued, "it keeps the dish fresh and non-monotonous. People use cream, salt, golden syrup, Greek yoghurt and even langoustine tails and scallops." "Cooking time can also be adjusted to individual preference, but simmering for ten minutes or more is typical for non-instant (and reportedly tastier) oatmeal. The US Consumer Reports Web site found that the more cooking required, the stronger the oat flavor and the less mushy the texture." "They tested 10 flavored instant oatmeals. The best rated was not a fast-cooking version, requiring about 30 minutes. But they were all good, chewy with a toasted nutty grain flavor; the slowest-cooking one was the best." "Jamie Oliver has uploaded a YouTube video showing how to make porridge in 5 different ways, and a viewer MrDoozy2000 made an interesting comment there." "Once the oatmeal is ready", he writes, "I make a sunny side up egg in a separate pan and once cooked I put the egg gently on top of the oatmeal. I sprinkle a little salt and pepper on top of the egg too. It's very filling and tastes great." "Another reader ScottMuzzaMuscles felt that salt should be added to Porridge only at the last minute because adding it too early can make the porridge tough. Adding it after you boil it and put it onto a simmer brings out a creamier texture."